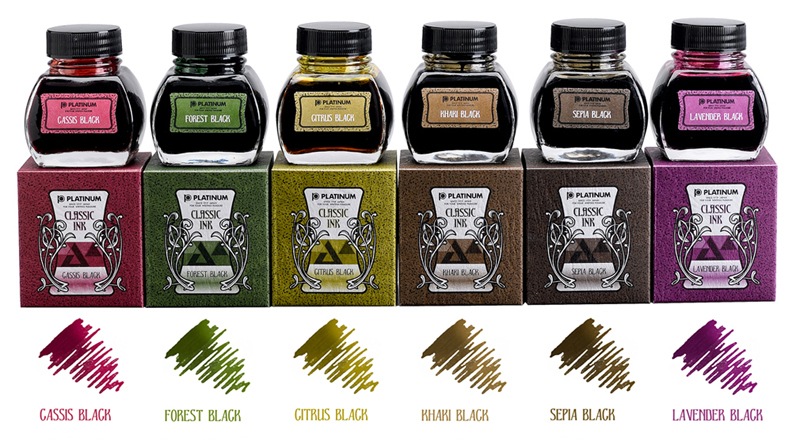 Although we have not personally sampled these inks just yet, look for our upcoming ink reviews on each color. Pen Chalet is very excited about these new “black” based colors and think they will be a hit. Platinum touts that each of these new ink colors will start off bright but steadily become darker as they dry to a shade of black. These changing color inks are water resistant and can be used as permanent document ink. Platinum intends that each of these inks will be able to produce significant shading, especially with larger nib sizes and flex or stub/italic type nibs, in order to provide a truly unique writing experience. Platinum Classic ink colors retail for $25.00 for a 60 cc. glass bottle, but will be available at Pen Chalet for $20.00. Pen Chalet is offering each new Platinum Classic fountain pen ink color as a pre-order today.